Summer is quickly becoming my favorite season for nail polish colors. I love the vibrant colors and the neon trend is so fun! I have another bright blue for you today, and that's Turquoise Tile by Finger Paints. 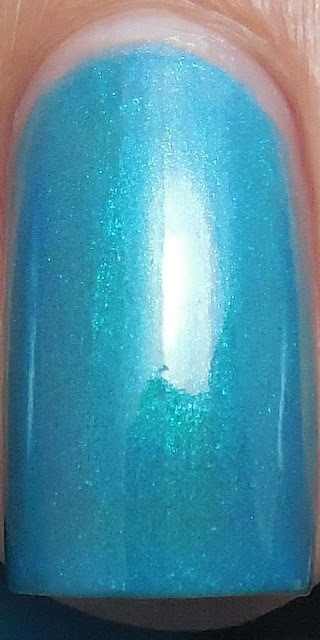 It's a lovely turquoise blue shimmer that has that glow-from-within effect. 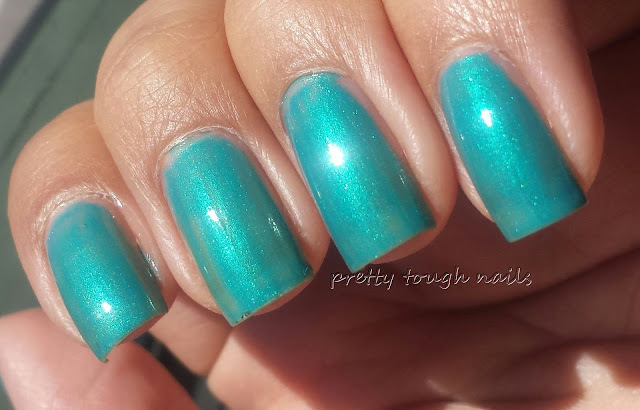 It's rare to find a polish that glows with shimmer, and this is one of them. The formula on this was excellent, two easy coats and I got decent opacity. No topcoat in these pictures so you can see the inherent shine. And one last pic of Turquoise Tile in sunshine - I snapped this in the car on the way to work with my camera phone. It's not the same mani as above, this one was more hastily applied(LO was napping so I had to act quick) with two super thin coats and a layer of Poshe. Don't you love that shimmer? I wish I could find more like this. One that comes to mind is Dior Exquis, but other than that, nothing else off the top of my head. Do you know any polishes with a glowing shimmer?